Dear Students, Find RSCIT Answer Key 8 July 2018. Next RSCIT Exam is going to be held on 8th July 2018. Exam date declared by Vardhamaan Mahaveer Open University, Kota. This exam is conducted all over Rajasthan at different centers, on 8th July 2018. RSCIT students are advised to get ready and keep learning. 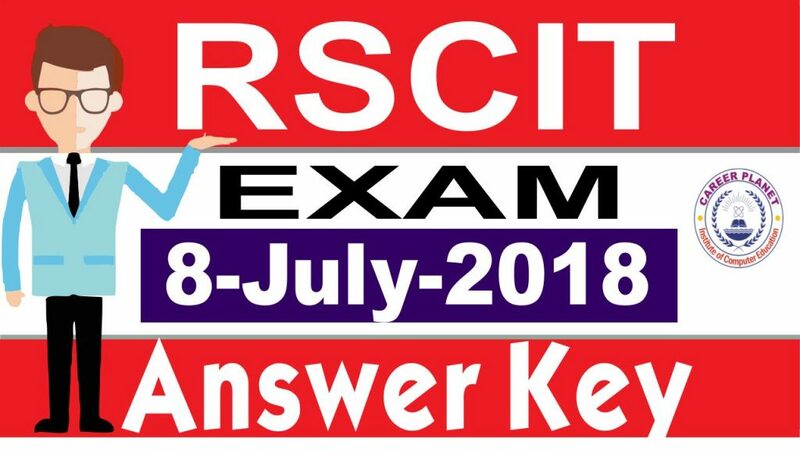 We are going to be published RSCIT answer key 8 July 2018, on this page. Video on our YouTube channel with paper solution in Hindi is also published on 8 July 2018 after 3 PM. You are advised to visit our YouTube Chanel or our website page post to match your OMR sheet with our answer key. RSCIT is a qualifying examination, which provides a certificate of basic computer knowledge to the students run by RKCL (Rajasthan Knowledge Corporation). The examination process of RSCIT exam is managed by VMOU (Vardhaman Mahaveer Open University), Kota. And, VMOU has announced Next RSCIT 2018 Exam date 8 July 2018 so; RSCIT Answer Key for 8 July 2018 will be available on this page soon. Kindly bring original copy of the admit card and any photo ID proof in original( (Aadhar Card, Dirving License, Voter's ID Card, Passport, Institution ID card etc.) along with you. Candidate should report at the examination center before 11:00 to 11:30 AM. After 1:30 AM a Candidate shall not be permitted to enter the examination center under any circumstance. Examination will be held on the basis of objective question and black or blue ball point pen shall be used by the candidate to fill the OMR sheet. Use of calculators, cell phones, pagers, or any electronic gadgets is not allowed in Examination Hall. The Examination center will not be changed in any case. 6 Digit Roll no has been allotted to the candidate and it is to be filled on OMR sheet carefully. There will be 4 Series in question booklet and any one series will be allotted to the candidate and it is to be filled on OMR sheet carefully. Candidate must bring writing pad with him/her. Kindly read read the instructions mentioned in on OMR sheet and question booklet carefully. Candidate has to mention the Roll No. on the Question Booklet. VMOU will be officially uploaded authorized rscit answer key 8 July 2018 Exam on their website. You can download it and check it, from the website- www.vmou.ac.in. You can also download and check it from our website. Medium – Hindi & English. Note: If your 14 question is correct then you are declared passed in the rscit exams by VMOU. Rajasthan State Certificate in Information Technology course in the state attempts to propagate IT Literacy and functionality among the people with a view to bridge the digital divide, resultant Knowledge divide, and opportunity divide. RS-CIT is a basic comprehensive computer course; designed in such a way that helps in developing a fundamental understanding of computers, helps in learning the essential skills to use a computer with confidence, be more productive at home or at work, use technology to complement lifestyle and growth in career. The government of Rajasthan has also found this course suitable for IT literacy and recognized under Department of IT & Communications. All RSCIT Students are advice to match their answer with officially approved answer key, which is published by VMOU Kota on their official website-www.rkcl.vmou.ac.in. RSCIT answer key published by VMOU, Kota after 2 to 3 days. You can watch old RSCIT exam paper and most important questions video on our YouTube Channel.